First published in Canada as 100 Mile Diet: A Year of Local Eating, Plenty is the first hand tale of two city dwellers who attempt (and ultimately succeed) to eat only food produced within a 100 mile radius of their home in Vancouver, British Columbia. Although blessed with a cornucopia of food choice that comes with living in a metropolitan centre they long for a closer connection to the food they put on their tables, to go beyond the neighbourhood (and seasonal) farmers market to shop for ingredients. This desire along with the realization that much of the food available to them is produced and shipped great distances and at great environmental cost propels them on their 100-mile diet quest. The book is told by the writer’s perspective points of view, hers is more personal and revealing of herself and their relationship and his more informative giving us an interesting glimpse into some cultural history of the British Columbia coast. He does all the cooking and is the one who initiated and more enthusiastically embraces the concept. She comes around to both the cooking and him quite nicely in the end though. 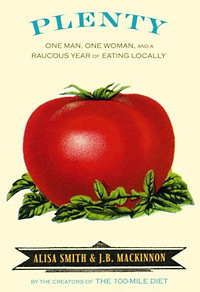 The book is organized monthly and while not a handbook for cooking local foods it does provide a handful of useful recipes and preserving tips. The authors’ journey becomes much more than they likely set out for it to be and discover that food does much more than sustain us. Their view that food is a culture and source of community we should celebrate and embrace every day is infectious, and as they show us possible. Plenty is a compelling and engaging read. And while one may challenge the logic of driving for over an hour to pick your own strawberries, the point of the book is more one of philosophy and ideals rather than science or economics. Where possible and whenever possible one should choose local over imported, support not only your local farmers and producers but save those seasonal foods for the time they are at their peak and meant to be enjoyed.